Most of the rooted Oneplus One users are not able to update their phone with the latest Official Android 6.0.1 Marshmallow [CM 13.0 ZNH0EAS26M]. Here in this tutorial, we’ll show you how to install the latest Android 6.0.1 Marshmallow on rooted oneplus one. The process is very simple and all you have to do some changes on your phone. First, you have to install the Stock recovery on your phone with the help of ADB commands, Second install the previous Full ROM zip file and in the last the latest Android 6.0 Marshmallow ZNH0EAS26M OTA zip file and you are done. This guide is only for the rooted oneplus one users and if you have the unrooted Oneplus one phone then follow this guide to install the latest update on your phone. Read All the instruction very carefully and follow all the steps one by one on your Oneplus One phone. Do take the full backup of your phone and save it on your PC or some other safe place. Step 2. Now download the Oneplus One Stock recovery here and rename the file to recovery.img. 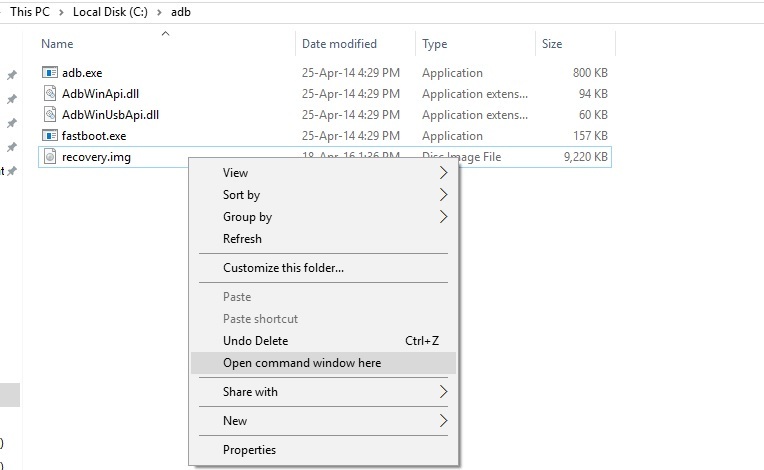 Place the file in the ADB folder that you created in step 1. Step 3. Now download the Previous Full ROM zip here [cm-12.1-YOG7DAS2K1-bacon-signed.zip] and save the zip file on y our phones internal memory. Step 4. Now download the latest official Android 6.0.1 OTA zip file here[cm-bacon-cee4e8702d-to-e36dd78050-signed.zip] and save in your phones internal memory. Step 5. Now boot your phone into fastboot mode. To do this switch off your phone and Hold the Volume Up button with Power button to boot the phone in fastboot mode. Step 6. Once your phone in fastboot mode, connect your phone to he PC with USB cable. And open a command window in your fastboot/adb folder (C:\adb). To do this Hold Shift button on your keyboard and right-click on the empty space of the folder. Step 7. To flash the Stock recovery on your phone. Now enter the following command to flash boot.img on your phone. Step 8. Once the Stock recovery is installed, boot your phone into stock recovery mode with this command. Step 9. Now your phone will boot in recovery mode. From here tap on the Apply Update > Choose From Internal Storage and Flash the Full ROM Zip file [cm-12.1-YOG7DAS2K1-bacon-signed.zip] that you saved on your phone in Step 3. Step 10. Once the file is flashed. Go back and Flash the OTA zip file [cm-bacon-cee4e8702d-to-e36dd78050-signed.zip] that you saved in step 4. Step 11. Once both the zip files is flashed. GO back and tap on the Reboot System now. 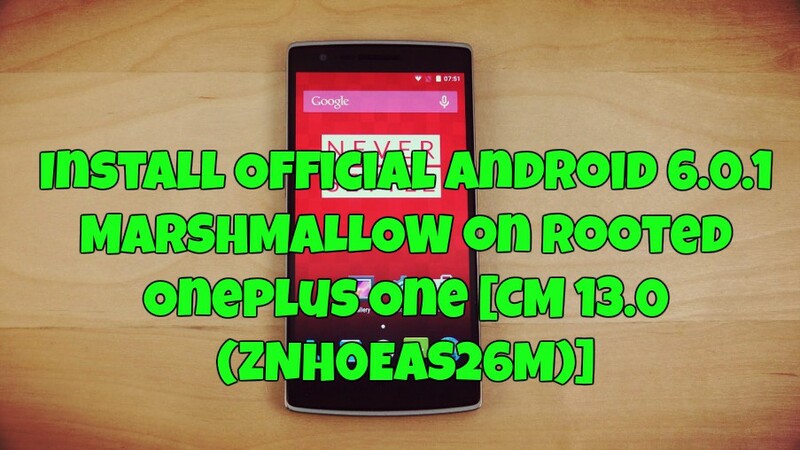 guys who are looking to upgrade it 4m 12 to cm 13 and who doesnot want to wait for the complete zip rom to get release. here are the step mentioned above. i did for my rooted devices by following the above step and trust me guys it is very easy and safe to do. and after upgradation i thought my app will be deleted but not has happened. so go ahead and ejoy flashing marshmallow. do leave a note and help others too. Will this also work for the latest version, with security patch of may? Is the ZNNOEAS2JK version a later update to this?